When I was young, my mother always told my sister and I, “Stand up straight”, or “Keep your back upright when you are walking!”. Growing up, keeping our backs straight was standard protocol in my household. When I used to walk to school, my mother would always be watching me from her window, so I worked very hard to walk “properly” in order to please her. At the age of 19 I started dancing, and that helped me keep my back even straighter – especially in ballet. In my ballet classes, I learned to squeeze my belly in to lift up my back. With daily stretching and training, I became really flexible. Or I believed I was, only because I was able to kick my leg to my face. Looking back now, my movement pattern was not well balanced. Luckily, I never hurt myself throughout a decade of dancing nor my musical theater career. I never bothered learning much about my body – I didn’t feel like I had to, because I had no particular issues. I loved movement. So when I discovered yoga much later in life, I was naturally drawn to the flowing practice of Vinyasa, Ashtanga, Dharma Yoga…you name it. This was post 9/11 in New York City when everybody was rushing to yoga classes to attain peace of mind. In these classes, I was able to focus on my breath and just move to the music without any care. Stretching also felt great, so I kept on stretching my body till no end. I would look at the beautiful yoginis in Yoga Journal covers and thought I could be just like them if I kept on practicing. I went to classes everyday in attempt to put myself in seemingly impossible poses. Eventually, my body started to give – it was hurting all over the place to the point where I was in pain 24/7. I could no longer relax – even in Shavasana. I was not able to get up from it without a great deal of effort. I was too ashamed to talk about my pain openly with my peers and believed the cause of my pain was all my fault. I realized I needed to change the course of my practice and began seeking out for alignment base classes. Around 2003, there was this one yoga lineage that was very popular. I would go to different teachers in that system and kept on hearing the same cues. “Tuck your tail bone”. I had a lot of pain around my lower back and hips, so I would go up to the teachers and ask – “How can I help my back pain?” They would reply, “Make sure to tuck your tail bone.“ So I would go home and practice tucking my tail. I had no idea what was happening to my body, and what the teachers were saying sounded correct. I was a yoga teacher by then, so I also started to mimic the language of “Tuck your tail” and “Plug your arms into the sockets” or “Stretch your arms overhead and slide your shoulder blades down”. I didn’t realize these cues may be beneficial to some, but were actually harmful to others. Surely, my condition did not improve – it got worse and worse! In 2005, during one of my yoga trainings in Santa Cruz, I met a chiropractor who said I had reverse curvature in my spine. “I have never seen anything like it,” he exclaimed, “Your spine is completely reversed from the beginning to the end”. This was very new to me. I didn’t have the slightest idea on what it meant. He suggested I see a local Chiropractor who could do a subtle manipulation. When I returned home to NYC I found a Chiropractor who told me I had a bulging disc in my L4 and L5. He adjusted my back which had gotten increasingly looser, but really didn’t address the issue of my pain. By then I was beginning to understand my body a little. My lumbar spines were very flat and stiff, and had zero mobility – zero! No wonder my upward facing dog had been a struggle! But I knew it wasn’t always this way. In my dancing days, I had no problem getting into deep backbends – So why was it getting hard now? What if over tucking my tail was taking out the necessary curvature from my already flat spine, causing further tightness? After studying with Amy Matthews and Leslie Kaminoff at Breathing Project for a few years, I discovered Yoga Tune Up®. I went to Kripalu Center to do the Level 1 training with Jill Miller and Lilee Chandra in 2011. At the time, I was recovering from a frozen shoulder and chronic lower back and hip pain. I remember once during the training, Lilee walked over to me because she saw me having trouble with a particular movement. The following conversation went like this. Lilee took a pregnant pause and looked at me straight in the eyes. She said, “Because it hurts.” I started to cry uncontrollably. Over time, this pain had become a part of me so in order to avoid it I found a way to shut down my body. I had stopped “feeling my body” or recognizing the effects of my defense mechanisms. I was a good daughter and student who listened and followed the direction of others, like those of my mother and the various dance and yoga teachers, to the point where my spine became immovably stiff and flat like an ironing board. I never paid attention to what my body wanted to do. It had been saying, “I want to heal”. It was then with my newfound realization, that my life started to take a turn. During that week of YTU training, Jill and Lilee had me face my pain and helped me figure a way out of it. Once I started to listen and work with it, my body began responding, and the change took place rapidly and dramatically. Today, I don’t struggle with that same debilitating pain. And when the pain tries to come back, I know how to care for it without relying on others. The human spine consists of five parts. There are seven vertabrae in the cervical spine (Neck, C1-C7), 12 in the thoracic spine (upper back, T1-T12), five in the lumbar spine (lower back, L1-L5), and five in the sacrum (Secrum, S1-S5, fused), four in the coccyx (Tailbone, fused). A healthy human spine when viewed from the side, has a beautiful S-shape curve. The convex forward shape is called the lordotic curve, present in the cervical and lumber spine. The concave forward shape is called a kyphotic curve, present in the thoracic spine. Over time, the shape of our spines changed according to our primal needs. First, while our ancestors roamed around the ground on their four limbs in search of food, the thoracic spine formed into a concave shape (out) in order to push their bodies away from the ground. Secondly, the neck had to be picked up to its convex position (in) so they could look for food or spot out a predator, before they could approach. The lumber curve (in) became more necessary as our ancestors started to gain the ability to bear weight on lower extremities – and began walking on two legs. The lumber curve is a human specific feature. (“Yoga Anatomy” by Leslie Kaminoff and Amy Matthews). The spine was developed over millions of years of human evolution to support the body’s weight and to protect the spinal cord. The curve of the spine can withstand great amounts of stress by providing a more even weight distribution. Also, when we walk or run, our spines undulate to support our movements. Amazingly, almost every human movement is assisted by the movement of our spine. If the spine doesn’t move well, we have to compensate by engaging other parts of the bodies. I remember looking at my parents form and thinking it must be genetic that I have a very flat spine. Or is it cultural? (My parents spent their youth during the Second World War in Japan where standing straight or bowing correctly were considered to be proper.) There are things I can do to reclaim my S-shape spine. One of the YTU exercises that helped me a lot was “Spinal Undulation”. When I teach this in my class, it is shocking that the majority of people are not in touch with their spines. When we go into “Cat and Cow” in a yoga class, most of us automatically go into the movement pattern we are used to. Moving from what moves…like the lower back, while part of our thoracic may be completely locked. By moving habitually, you won’t be able to figure out where your blind spots are. Try YTU Spinal Undulation, take your time, remember to breathe, and feel the movement in your spines. The part that’s not moving needs to be awakened and retrained. The part that is moving a lot may be the answer to the pain in your back. This exercise is helpful for you to feel your S-shape Spine. One of the biggest reasons why YTU is so helpful is it makes you become more aware of your body – Not anybody else’s, but yours! One of my favorite activities is to go to the Museum of Natural History in NYC to visit the Dinosaur exhibit. When you see the different bony structures from over many millions of years, the result of evolution is evident. Yet, we are all exactly alike. When I witness this I get welled up with the realization that we are all ONE. Destruction sounds bad. But we know sometimes it is necessary to destroy, change, or end things. Especially when you know that the situation you are in is not serving you. But way too often, we don’t know what is truly good for us…. Because we become too numb to feel things. Particularly if you have been living a lukewarm life without too many challenges. The Lord Shiva destroys “ignorance”. Ignorance can be translated into many different things. Humans are a creature of habits. We find such comfort staying in one place. We want to sit at the same desk or the same park bench. We want to celebrate holidays the same way.….. year after year. I’ve seen it happen to people. So many people have trouble moving on even when they know their jobs are not working out for them, or they may be in a wrong industry all together and complain that they have not been able to realize their full potential. Nowadays with the rapid change of technology, we need to look at our situations often and consider making some changes. I understand cockroaches are one of these very advanced creatures that are able to morph into another being. They modify their cell structure to survive against their biggest predator- Bug spray. You may be able to kill a roach with a particular kind of bug spray today, but the same spray may not kill them next week. I am not a big fan of cockroach, but have always wanted to live my life that way. First, “recognize the need to change”- this could a tough one. Then, “having the courage to change”- this is nearly impossible for a lot of us. As a Yogi, we know anything is possible with practice. But while the practice takes years of discipline, only thing we need may be one powerful life changing occurrence which totally awakens us. Have you ever had pain on the side of your lower back after a long day of driving or working at your desk? Well then, most likely your Quadratus Lumborum on that side is screaming at you. The Quadratus Lumborum, aka QL, is a long, wide, flat, trapezoidal muscle closely resembling a flank steak. It originates from the bottom of the 12th rib and lumbar verdabrae, L1~L4. It inserts on top of the iliac crest (hip bone), exists on both sides of the body, and connects the pelvis to the spine. It is the deepest abdominal muscle and is close to the Psoas and Erector spinae. Both sides of the QL work together to extend your spine, and one side works independently to laterally flex the spine. Very powerful muscle indeed! We hear a lot that the dysfunction of the QL is a common cause of lower back pain. Why? When I was growing up in Japan, there were really no chairs in my house. The floors were covered with Tatami mattresses, which are made of weaved straw. Tatami is soft on the surface and provides a very solid and stable structure. We used to sit on Tatami to eat, study, and play. Whenever we visited the Buddhist Temple, we would sit on our feet – Seiza style – on Tatami, sitting with our spines erect for a long time as our feet would fall asleep. We would squat to use the bathroom. I still remember when I was 10 or 11, our life styles dramatically changed. Suddenly, there appeared couches, tables, and chairs in my house. The bathroom miraculously turned into a comfortable western style toilet with a toilet seat. We said “Sayonara!” to Tatami and said “Hello!” to the wooden floor…It was wonderful. We embraced the changes with such joy! After all, at that time, I thought it was so much more comfortable to sit on a chair. After 40 years of life with chairs, only recently, I started to give up my couches and chairs to go back to my old lifestyle. I realized that my back feels so much better. 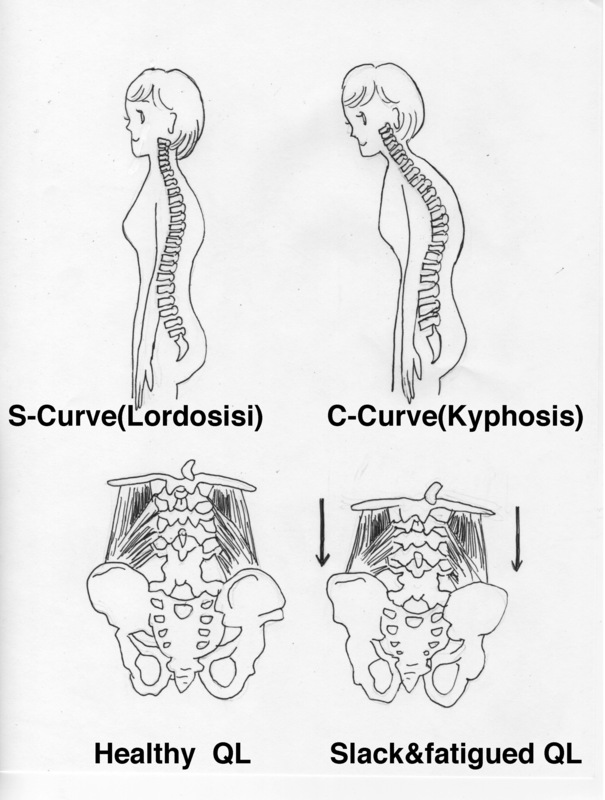 Sitting on a couch, chair, or car seat for long hours will conform our backs to a C-shaped curve, (kyphosis) instead of its most healthy state (lordosis) …. the S- shaped curve. The C-Curve pasture will contract our QL and erector spinae into slack, which results in muscle fatigue. The muscle will then experience decreased blood flow, and in time, adhesions in the muscle and fascia can form….. Eventually, this will result in painful muscle spasms, bulged discs, or even disc herniation. Scary thought…but there are solutions, such as, lengthening the spine, laterally extending the spine with yoga poses like, Adho Mukha Svanasana and Parighasana. But when mere stretching doesn’t do our muscles justice, we need to consider waking them up by approaching the practice differently. Yoga Tune Up ® Pose Boomerang will teach us just that. Stand in Tadasana (Mountain Pose) besides a wall so your shoulders and hips are perpendicular to the wall. Your inside hand is on the wall with your elbow bent, and your other hand is touching the wall. Reach the outside arm overhead and touch the wall with your hand, so both hands and shoulders are internally rotated. The spine is extended on the outside, flexed on the inside. You will feel an intense stretch on the outside of the body and the QL. Now, attempt to pull the top hand up the wall as if you are trying to peel the paint off. Because the hand is pinned to the wall, it will not actually move, but try. As you try to move your hands apart, the QL will contract. Keep applying the pressure while breathing deeply about 5 breaths. 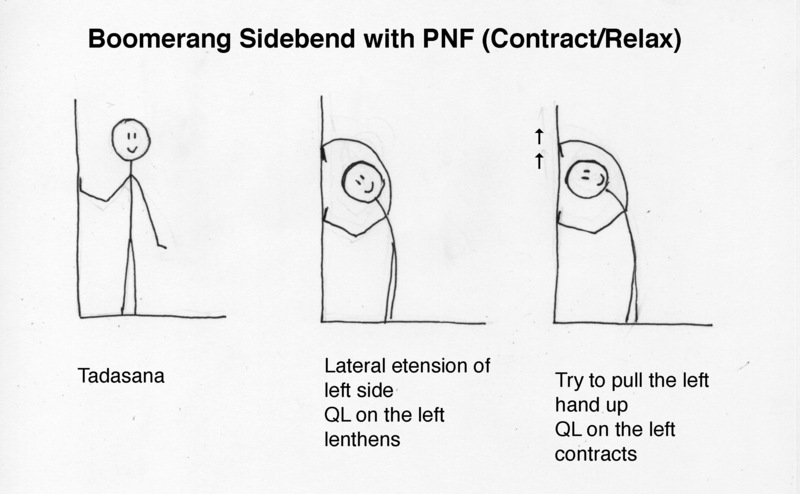 This action will create PNF – Proprioceptive Neuromuscular Facilitation- to increase your range of motion and strengthen the QL muscle that is stretched and contracted. Here is also a video footage for you so you can practice with me. The best part of this pose is that you don’t need much space – Just a little wall space will do – so why not spend 10 minutes in between work or that long drive to get up and shake your booty? I assure you, with regular practice, your back will feel so much better – Good luck!